In preparation for my recent “May the 4th Be with You” blog hop, I made two bentos. This is the one that did not make the cut for the hop. But I thought that it would still be nice to share. 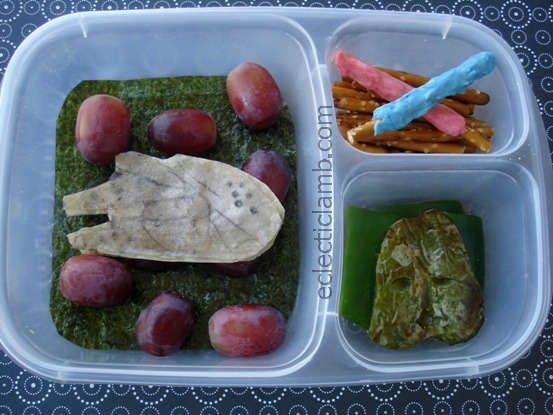 This entry was posted in Bento / Cute Food and tagged bento, Star Wars, vegetarian. Bookmark the permalink. Very creative! I love how you use unconventional bento ingredients to make your bento, rather than rice, nori, and sliced bread. Thank you Winnie! I had not thought about that but I sometimes think I use quesadillas too much. But tortillas are versatile! I love it. Thanks for linking up! Love the way you did the light sabers! Thank you! I struggled with them. The melted white chocolate I used was stiffer than I wanted, had to mold the chocolate around the pretzel sticks.